In this tutorial, you convert MP4 media files in parallel to MP3 format using the ffmpeg open-source tool. Windows 64-bit version of ffmpeg 3.4 (.zip). Download the zip file to your local computer. For this tutorial, you only need the zip file. You do not need to unzip the file or install it locally. Use the Azure portal to add ffmpeg to your Batch account as an application package. Application packages help you manage task applications and their deployment to the compute nodes in your pool. 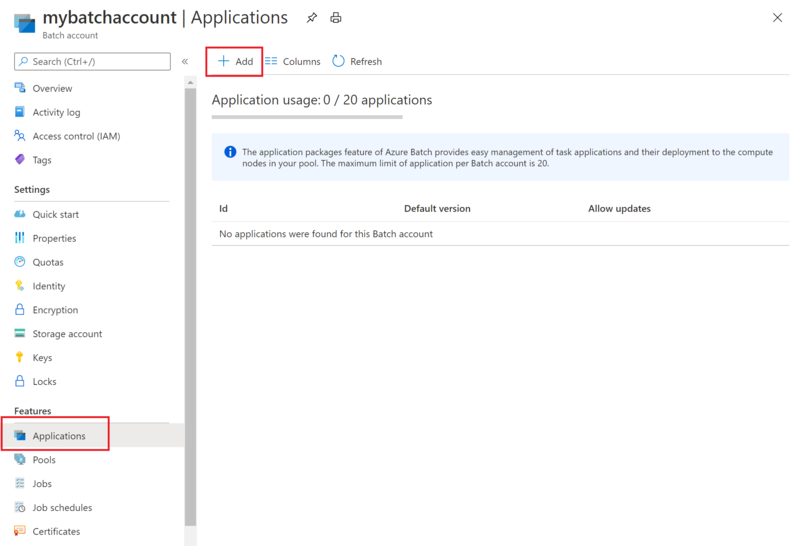 In the Azure portal, click More services > Batch accounts, and click the name of your Batch account. For Application id enter ffmpeg, and a package version of 3.4. Select the ffmpeg zip file you downloaded previously, and then click OK. The ffmpeg application package is added to your Batch account. Navigate to the directory that contains the Visual Studio solution file BatchDotNetFfmpegTutorial.sln. Also, make sure that the ffmpeg application package reference in the solution matches the Id and version of the ffmpeg package that you uploaded to your Batch account. Right-click the solution in Solution Explorer and click Build Solution. Then run it. When you run the sample application, the console output is similar to the following. During execution, you experience a pause at Monitoring all tasks for 'Completed' state, timeout in 00:30:00... while the pool's compute nodes are started. Success! All tasks completed successfully within the specified timeout period. Go to your Batch account in the Azure portal to monitor the pool, compute nodes, job, and tasks. For example, to see a heat map of the compute nodes in your pool, click Pools > WinFFmpegPool. Typical execution time is approximately 10 minutes when you run the application in its default configuration. Pool creation takes the most time. You can use the Azure portal to download the output MP3 files generated by the ffmpeg tasks. Click All services > Storage accounts, and then click the name of your storage account. Right-click one of the output MP3 files and then click Download. Follow the prompts in your browser to open or save the file. Although not shown in this sample, you can also download the files programmatically from the compute nodes or from the storage container. The following sections break down the sample application into the steps that it performs to process a workload in the Batch service. Refer to the file Program.cs in the solution while you read the rest of this article, since not every line of code in the sample is discussed. 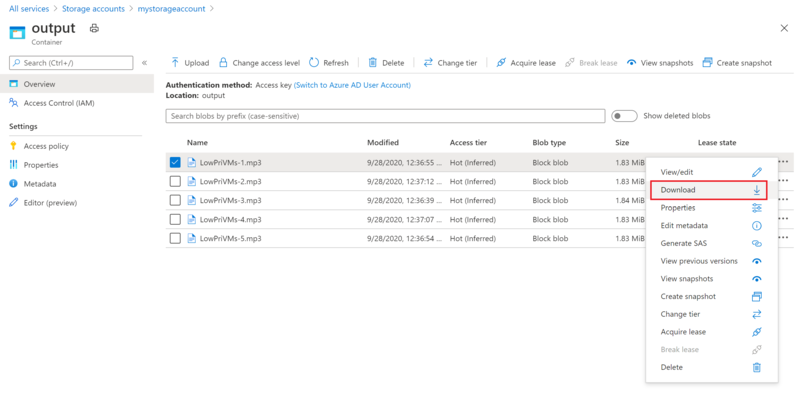 To interact with the linked storage account, the app uses the Azure Storage Client Library for .NET. It creates a reference to the account with CloudStorageAccount, authenticating using shared key authentication. Then, it creates a CloudBlobClient. The app creates a BatchClient object to create and manage pools, jobs, and tasks in the Batch service. The Batch client in the sample uses shared key authentication. Batch also supports authentication through Azure Active Directory to authenticate individual users or an unattended application. The app passes the blobClient object to the CreateContainerIfNotExistAsync method to create a storage container for the input files (MP4 format) and a container for the task output. Then, files are uploaded to the input container from the local InputFiles folder. The files in storage are defined as Batch ResourceFile objects that Batch can later download to compute nodes. UploadResourceFilesToContainerAsync: Returns a collection of ResourceFile objects and internally calls UploadResourceFileToContainerAsync to upload each file that is passed in the inputFilePaths parameter. UploadResourceFileToContainerAsync: Uploads each file as a blob to the input container. After uploading the file, it obtains a shared access signature (SAS) for the blob and returns a ResourceFile object to represent it. For details about uploading files as blobs to a storage account with .NET, see Upload, download, and list blobs using .NET. Next, the sample creates a pool of compute nodes in the Batch account with a call to CreatePoolIfNotExistAsync. This defined method uses the BatchClient.PoolOperations.CreatePool method to set the number of nodes, VM size, and a pool configuration. Here, a VirtualMachineConfiguration object specifies an ImageReference to a Windows Server image published in the Azure Marketplace. Batch supports a wide range of VM images in the Azure Marketplace, as well as custom VM images. The number of nodes and VM size are set using defined constants. Batch supports dedicated nodes and low-priority nodes, and you can use either or both in your pools. Dedicated nodes are reserved for your pool. Low-priority nodes are offered at a reduced price from surplus VM capacity in Azure. Low-priority nodes become unavailable if Azure does not have enough capacity. The sample by default creates a pool containing only 5 low-priority nodes in size Standard_A1_v2. The ffmpeg application is deployed to the compute nodes by adding an ApplicationPackageReference to the pool configuration. The CommitAsync method submits the pool to the Batch service. A Batch job specifies a pool to run tasks on and optional settings such as a priority and schedule for the work. The sample creates a job with a call to CreateJobAsync. This defined method uses the BatchClient.JobOperations.CreateJob method to create a job on your pool. The CommitAsync method submits the job to the Batch service. Initially the job has no tasks. The sample creates tasks in the job with a call to the AddTasksAsync method, which creates a list of CloudTask objects. Each CloudTask runs ffmpeg to process an input ResourceFile object using a CommandLine property. ffmpeg was previously installed on each node when the pool was created. Here, the command line runs ffmpeg to convert each input MP4 (video) file to an MP3 (audio) file. The sample creates an OutputFile object for the MP3 file after running the command line. Each task's output files (one, in this case) are uploaded to a container in the linked storage account, using the task's OutputFiles property. Previously in the code sample, a shared access signature URL (outputContainerSasUrl) was obtained to provide write access to the output container. Note the conditions set on the outputFile object. An output file from a task is only uploaded to the container after the task has successfully completed (OutputFileUploadCondition.TaskSuccess). See the full code sample on GitHub for further implementation details. Then, the sample adds tasks to the job with the AddTaskAsync method, which queues them to run on the compute nodes. // Create a collection to hold the tasks added to the job. // Define task command line to convert each input file. When Batch adds tasks to a job, the service automatically queues and schedules them for execution on compute nodes in the associated pool. Based on the settings you specify, Batch handles all task queuing, scheduling, retrying, and other task administration duties. There are many approaches to monitoring task execution. This sample defines a MonitorTasks method to report only on completion and task failure or success states. The MonitorTasks code specifies an ODATADetailLevel to efficiently select only minimal information about the tasks. Then, it creates a TaskStateMonitor, which provides helper utilities for monitoring task states. In MonitorTasks, the sample waits for all tasks to reach TaskState.Completed within a time limit. Then it terminates the job and reports on any tasks that completed but may have encountered a failure such as a non-zero exit code. After it runs the tasks, the app automatically deletes the input storage container it created, and gives you the option to delete the Batch pool and job. The BatchClient's JobOperations and PoolOperations classes both have corresponding delete methods, which are called if you confirm deletion. Although you're not charged for jobs and tasks themselves, you are charged for compute nodes. Thus, we recommend that you allocate pools only as needed. When you delete the pool, all task output on the nodes is deleted. However, the output files remain in the storage account. For more examples of using the .NET API to schedule and process Batch workloads, see the samples on GitHub.